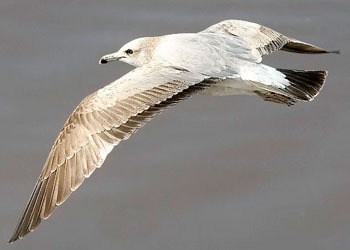 Below you will find a description of Chapter 36 THAYER'S GULL Larus thayeri, as published in one of the best Gull publication: "Gulls of the Americas" by Steve Howell & Jon Dunn. "we" in the text below refers to the original authors. If any errors occur in this text, please let me know and mail to marsmuusseatgmaildotcom. Thayer's Gull 2nd cycle, February 24 2009, Vancouver Island, BC (Guy Monty). Delicately built. 2nd generation primaries, pink base of bill and single grey-based feathers in scapular region. Thayer's Gull 2nd cycle, December 08 2012, Lake County, IL (Amar Ayyash). 2nd gen flight feathers, P10 with 'ghost mirror'. Fine vermiculation on the tips of P1-P4. Scapular region almost completely grey, but still intermixed with faint grown feathers. Tail almost completely dark and bill predominantly dark. Thayer's Gull 2nd cycle, mid-January 2014, central California (Amar Ayyash). Bi-coloured bill, dark iris, and the legs are clean, deep pink. No mirror on P10. Primaries are darkest part of the bird. Thayer's Gull 2nd cycle, mid-January 2014, central California (Amar Ayyash). Tertials have solidly brown centres, and rather uniform mid brown greater coverts. Few greyish feathers in the scapulars. 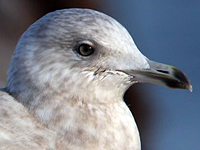 Thayer’s Gull is medium-large, fairly long winged, and relatively slender billed, but its measurements overlap with most other large gulls, so identification should be based on a suite of characters. 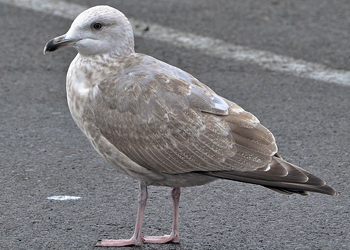 In particular, note overall size and structure (in comparison to gulls of known identity), especially bill size and shape, and wingtip pattern. 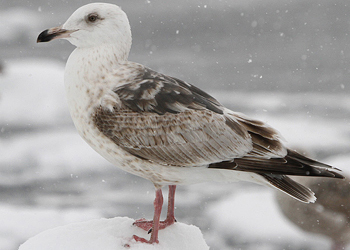 The main confusion species are American Herring Gull and Kumlien’s Gull. Note size and structure, especially of the bill and head, and pattern of the outer primaries. 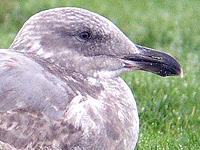 AMERICAN HERRING GULL averages larger with a stouter bill, often shows a shallower sloping forehead. 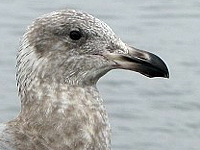 Best plumage feature is more extensively dark inner webs of outer primaries, so pale inner primary panel on upperwing contrasts more with more solidly dark outer primaries; underside of outer primaries darker (but can be reflectively pale); tail of Herring often more extensively blackish and eye often pale at this age (rarely so on Thayer’s). 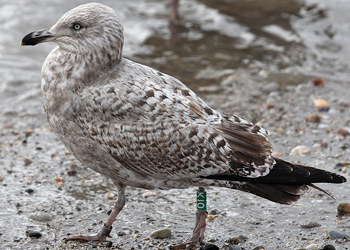 American Herring Gull (smithsonianus) 2nd cycle K10 February 22 2013, Circle Beach, CT (Keith Mueller). Banded July 12, 2011. 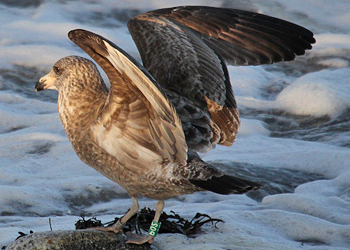 Scapulars are a mix of old brown and new greyish brown feathers, but there is no sign of any grey adult-like feathers. American Herring Gull (smithsonianus) 2nd cycle P02 March 05 2012, NH Coast. Picture: Keith Mueller. Banded July 15 2010. Classic 2nd cycle plumage with pale panel on inner primaries, and mostly dark outer primaries. KUMLIEN’S GULL averages slightly shorter bill and shorter, less pointed wingtips; wingtips overall paler with dark on outer webs usually restricted to P7-P10 and often boldest on P8-P9 (versus equally distinct dark outer webs to P6-P10 on Thayer’s); tertials rarely as solidly dark brown as some Thayer’s, and wingtips of many birds pale brown to whitish. Presumed hybrids with Thayer’s look intermediate and are not safely assigned to either taxon. 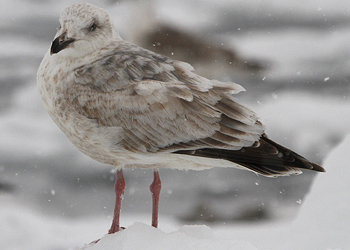 Kumlien's Gull (kumlieni) 2nd cycle C2 January 23 2013, Newfoundland (Bruce Mactavish). Band on bill, patterned 2nd generation coverts, patterned rump, rounded 2nd generation primaries and dark iris. Primaries with greyish centres. 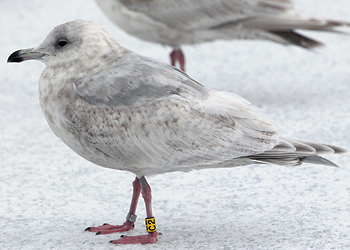 Kumlien's Gull (kumlieni) 2nd cycle C4 January 24 2013, Newfoundland (Peter Adriaens). Note dark outer primaries and rather solid dark tail-band. 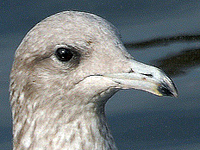 VEGA GULL can look similar to Thayer’s but averages larger with stouter bill; often has shallower sloping forehead. Best plumage feature is more extensively dark inner webs of outer primaries, so pale inner primary panel on upperwing contrasts more with more solidly dark outer primaries; underside of outer primaries darker (but can be reflectively pale). Vega Gull (vegae) 2nd cycle, December 27 2009 - January 04 2010, Choshi, Japan (Chris Gibbins). Very pale on rump and proximal half of rectrices. Markings on undertail coverts widely spaced. If any grey tone present on fresh feathers, this is a shade darker than on smithsonianus. Vega Gull (vegae) 2nd cycle, December 27 2009 - January 04 2010, Choshi, Japan (Chris Gibbins). Very pale on rump and proximal half of rectrices. Markings on undertail coverts widely spaced. If any grey tone present on fresh feathers, this is a shade darker than on smithsonianus. 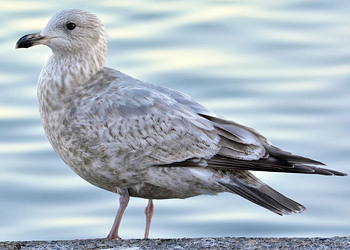 HYBRID GLAUCOUS-WINGED X AMERICAN HERRING GULL best separated from Thayer’s by structure, especially bigger bill; plumage characters need study. Cook-Inlet Gull (glaucescens x smithsonianus) 2nd cycle, January 01 2012, Sayer's Park, WA (Amar Ayyash). Tend to show smaller bills than Olympics. Cook-Inlet Gull (glaucescens x smithsonianus) 2nd cycle, January 01 2012, Mouth of the Cedar River, WA (Amar Ayyash). Tend to show smaller bills than Olympics. 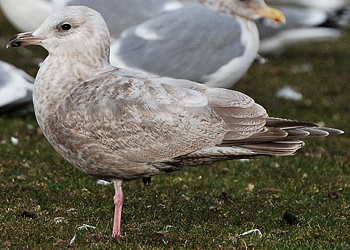 HYBRID GLAUCOUS-WINGED GULL X WESTERN GULL best separated from. Thayer’s by structure, especially bigger bill; plumage characters need study. Olympic Gull (occidentalis x glaucescens) 2nd cycle, January 02 2012, Gray's Harbor, WA (Amar Ayyash). Bulky bird. Mottled texture as in Glaucous-winged, medium grey tail and primaries as in Western, pale grey upperparts intermediate. Olympic Gull (occidentalis x glaucescens) 3rd cycle, January 02 2012, Gray's Harbor, WA (Amar Ayyash). Bulky bird. Mottled texture as in Glaucous-winged, dark grey in tail and primaries indicate Western influence; pale grey upperparts intermediate. 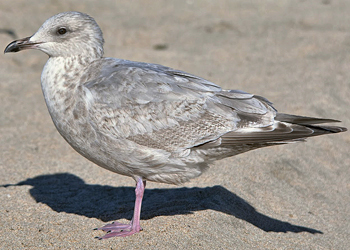 CALIFORNIA GULL typically has well-defined gray saddle, and gray of upperparts averages darker (Kodak 5-7.5), but some closely resemble Thayer’s in plumage: note California’s longer and blacker wing projection, more parallel-edged bill, and often a blue-green hue to the tibia. 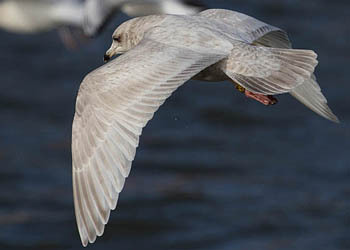 In flight, note restricted pale inner primary panel (usually on inner 3-4 primaries) and solidly dark outer primaries of California. 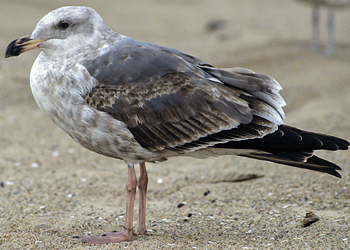 California Gull (californicus) 2nd cycle, January 25 2003, Capitola, CA (Jeff Poklen). Classic "grey saddle". 2nd gen flight feathers. Several wing-coverts and the upper tertials included in the partial autumn moult, now more adult-like than other coverts. 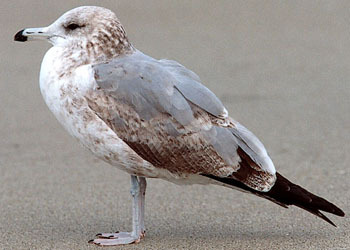 California Gull (californicus) 2nd cycle, November 09 2005, Half Moon Bay, CA (Jeff Poklen). Classic "grey saddle". Several wing-coverts and the upper tertials included in the partial autumn moult, now more adult-like than other coverts. 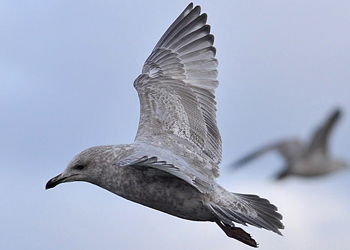 HYBRID GLAUCOUS GULL X AMERICAN HERRING GULL. Should be separable by size and structure, especially bill; wingtip and tail pattern might resemble Thayer’s, but range of variation poorly known. Glaucous Gull x Herring Gull 2nd cycle, 2nd cycle, December 24 2007, Newfoundland (Kirk Zufelt). 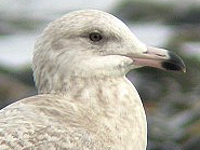 Head shape and especially primary pigmentation not good for pure Glaucous Gull. 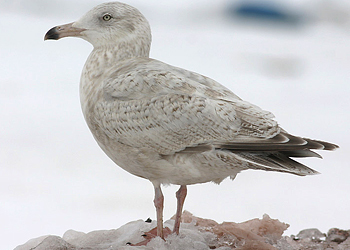 Glaucous Gull x Herring Gull 2nd cycle, March 16 2006, Newfoundland (Bruce Mactavish). Note primary pattern. 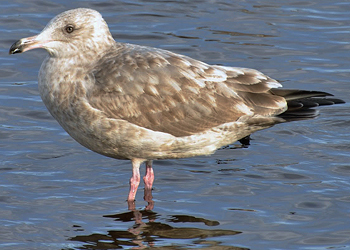 WESTERN GULL larger and bulkier with broad wings and stouter, bulbous-tipped bill. Plumage generally darker with black wingtips usually with some slaty gray on upperparts by late winter; upperwing lacks strongly contrasting pale panel on inner primaries, and outer primaries solidly blackish. 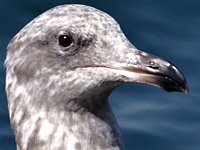 Western Gull occidentalis 2nd cycle, November 1985, California (Alex Abela). Note pattern on 2nd gen secondaries. Partial autumn moult included some coverts: GC2-3, MC3, LLC4-7 and few LC, which look fresh and are plain grey. Western Gull occidentalis 2nd cycle, February 24 2007, Orange Co (John Avise). Broad-winged. All flight feathers 2nd generation. 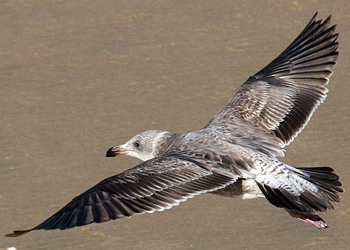 SLATY-BACKED GULL should be separable by structure, being larger and bulkier with broad wings, shorter wing projection, longer legs, and stouter bill. 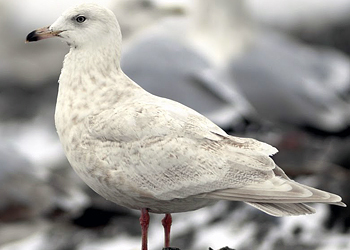 Plumage generally darker overall, usually with some slaty gray on back by late winter, tail more blackish, and dark/light contrast on outer primaries averages weaker at shaft. 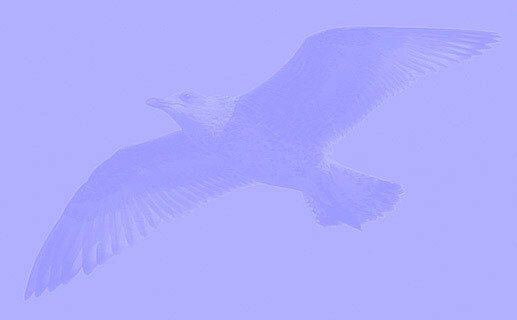 Slaty-backed Gull (schistisagus) 2nd cycle, February 13 2013, Rausu, Japan (Mike Buckland). Pale bird on underparts and head. Fresh scapulars indicate upperpart colour of adult plumage. 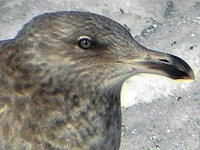 Slaty-backed Gull (schistisagus) 2nd cycle, February 13 2013, Rausu, Japan (Mike Buckland). Pale bird on underparts and head. 2nd gen flight feathers with much dark in tail. Note skirt. 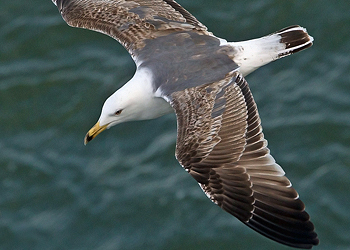 LESSER BLACK-BACKED GULL slimmer and longer winged; mostly black bill often boldly tipped creamy. Upperparts distinctly darker, upperwing lacks contrasting pale panel on inner primaries, and outer primaries solidly dark. Lesser Black-backed Gull (graellsii) 2nd cycle SV March 29 2009, Madrid, Spain (Delfín González). 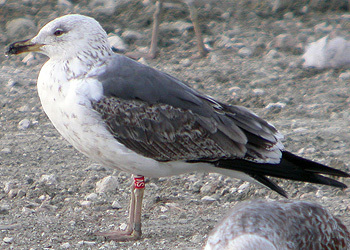 Banded July 2007 in the Netherlands. Classic "grey saddle". Several wing-coverts and the upper tertials included in the partial autumn moult, now more adult-like than other coverts. 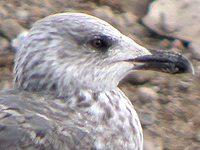 Lesser Black-backed Gull (graellsii) 2nd cycle, April 28 2012, Belfast, N Ireland (Graham Ekins). Classic "grey saddle". 2nd gen flight feathers, except for one pair of rectrices replaced on winter grounds (now white, 3rd gen). Several wing-coverts and the upper tertials included in the partial autumn moult, now more adult-like than other coverts. 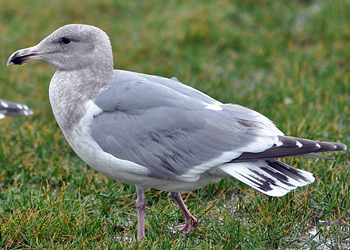 American Herring Gull, Kumlien’s Gull, California Gull, and hybrids differ in much the same ways as do adults (see above and relevant accounts); note Thayer’s bill size and shape and two-tone outer primaries. Thayer's Gull 2nd cycle (2CY), November 30 2011, Lake County, IL. Picture: Amar Ayyash. Thayer's Gull 2nd cycle (2CY), November 30 2013, Lake County, IL. Picture: Amar Ayyash. 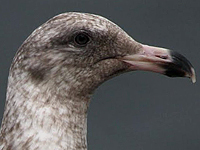 Thayer's Gull (?) 2nd cycle, November 17 2009, Wisconsin Point, Superior, WI. Picture: Erik Bruhnke.